This past August I visited Romania with my children. Romania is the place of my birth and where I lived for the first 21 years of my life. As crazy as it sounds, I have seen more of the rest of the world than my own country. It was time to change that and scratch off some of the points of interest in Romania I had from my bucket list. Transylvania occupies a significant portion of the centre of Romania. 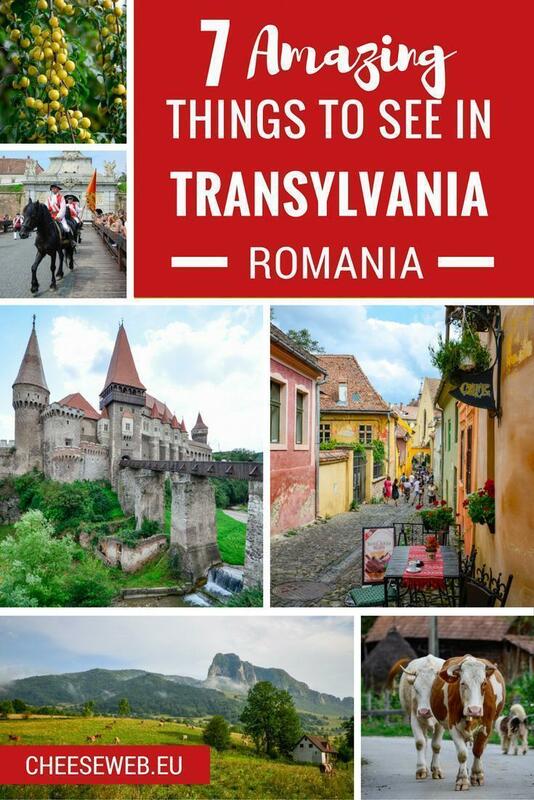 While it is commonly associated with vampires, due to Bram Stoker’s famous novel, Dracula, it is also famous for scenic landscapes, historic, medieval cities, and undisturbed country life. 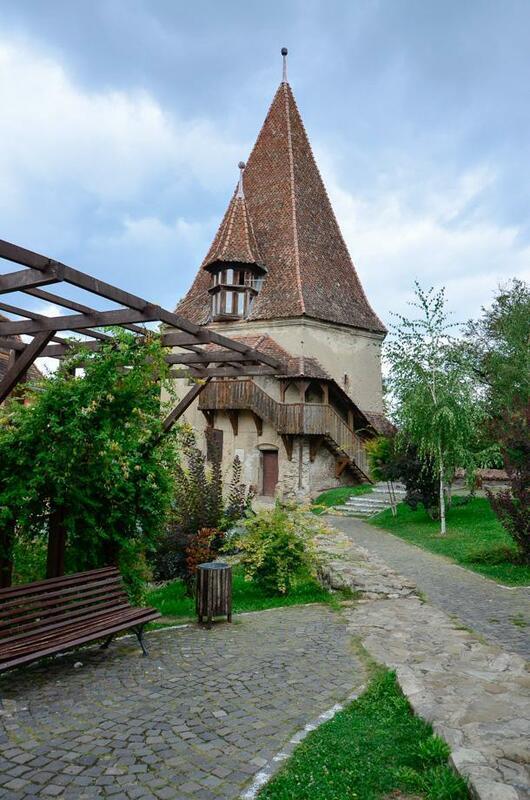 Because I have family in Salciua de Jos, a little village in the Trascau Mountains, it was the perfect home-base for visiting the Transylvania. Otherwise, I recommend avoiding hotels and finding a pension. 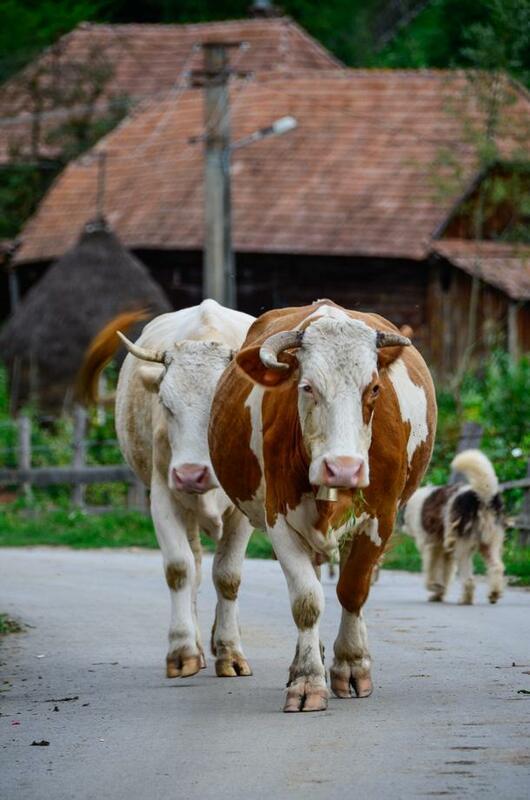 Rural tourism is well developed in Romania, and you will find excellent and very affordable pensions and farm stays all over the countryside. Imagine staying in a rural pension with a Romanian family in these stunning country landscapes, in Transylvania! When choosing a pension, expect to be greeted and treated like family. Most pensions offer homemade menus that are guaranteed to please. 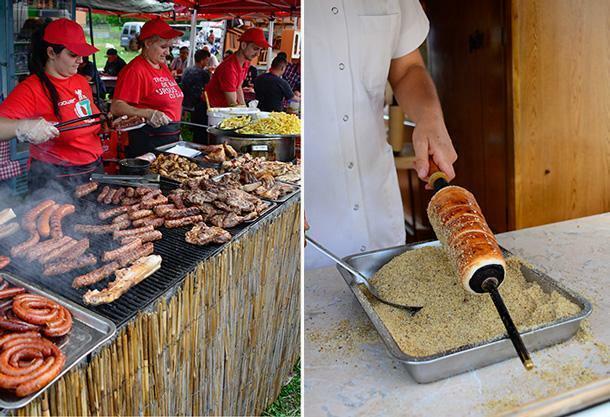 Traditional Romanian food is on the heavy side, especially in the countryside; with fresh meats, cured meats, and starches. 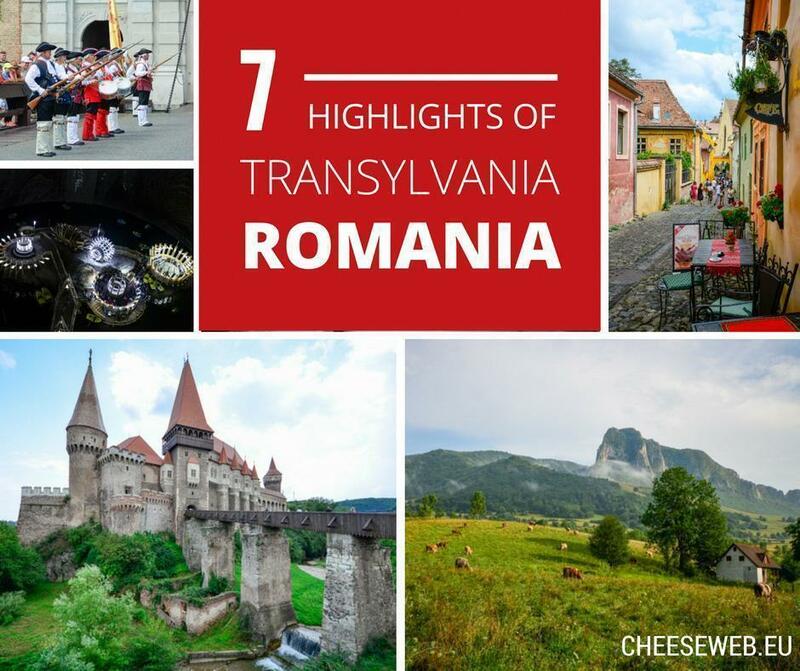 Accept your waistline will suffer while visiting Transylvania. The first thing I wanted to see in Transylvania was Turda Salt Mine (Salina Turda), located in the Durgău-Valea Sărată area. It is hard to believe a place like this exists as it looks as if it was made in the future. 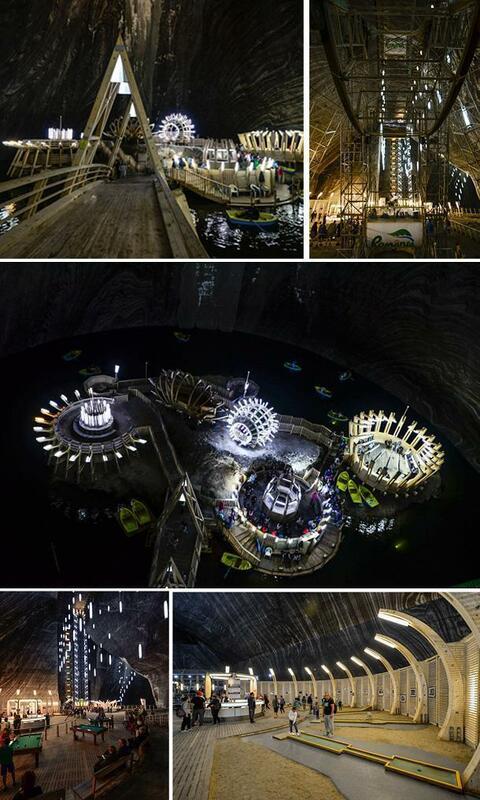 Major publications have deemed Turda Salt Mine one of the “coolest underground places in the world”. 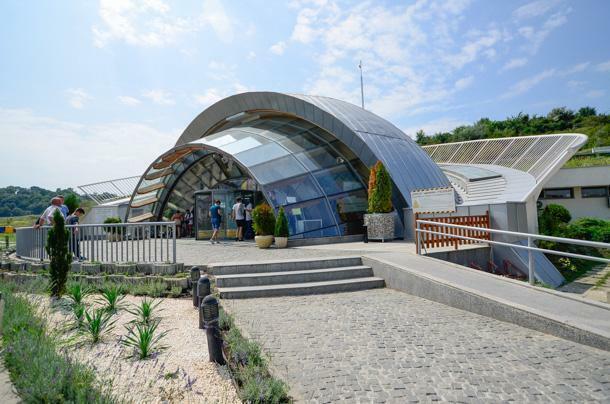 Since opening in 1992, the salt mine has been visited by over two million tourists. The mine’s main hall is 80m tall and 87m in diameter, and it is an underground amusement park and playground. It’s hard to tell from the entrance to the Turda Salt Mine there’s a whole underground theme-park below. Inside there is something for all ages. The little ones have a designated play area. For teens and adults, there is bowling, table tennis, pool, and mini-golf. The salt mine also has a small lake where you can rent a boat for a short period. My favourite of all, the slow turning Ferris wheel allows you to see the entire hall due to the 360-degree view in the cabin. The mini amphitheatre, newly built, can be rented for a couple of hours, for small concerts and plays. There is a downside to the park, though. Due to the high volume of people, there is quite a waiting period for all the activities. We went right when they opened, and we were able only to get on the Ferris wheel. After a couple of hours, the park was full of people. 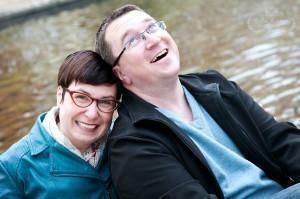 If you have plans to stay and play, allocate a whole day for the salt mine. Once inside, there are only two ways to get underground. Take the old wooden staircase down thirteen flights of stairs or wait in line for the modern elevator. Bear in mind only seven people can enter at once so it can take a while. Go early to shorten the wait. The temperature is at a constant 9 degrees Celsius so an extra layer is advisable. 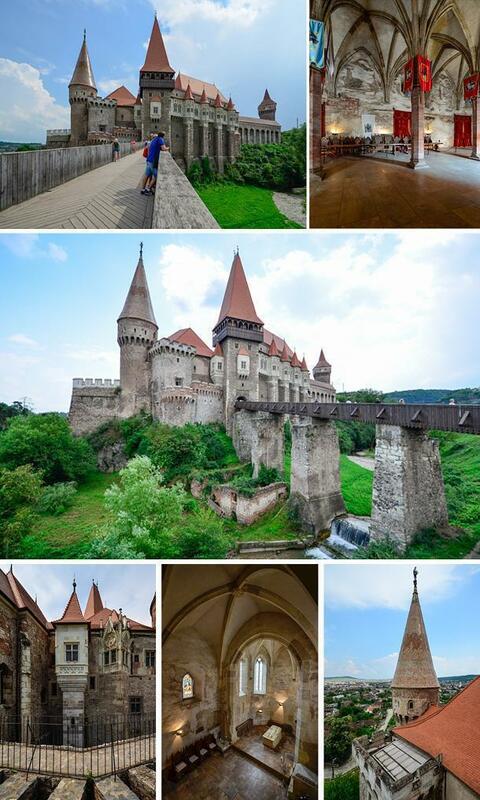 Next point of interest was Corvin Castle, or Hunedoara Castle, in Hunedoara. The castle is the greatest Gothic-style castle in Romania, one of the largest castles in Europe, and is one of the seven wonders of Romania. Corvin Castle is a stunning example of Transylvania’s historic landmarks. Built in 1446 by John Hunyadi (Iancu de Hunedoara), in the Renaissance-Gothic style, the castle holds a series of legends including one about Vlad the Impaler. Although it’s never been proven, it is said he was imprisoned in this 15th-century castle’s dungeon for seven years. This lengthy time period made him go insane and turn to his darker thoughts. Some historians say he was here for only a few months. This theory has never been proven either, even though it is more popular among specialists than the first one. The castle was under construction for many years so I patiently waited for the scaffolding to come down. At the end of the long wait, the Corvin Castle revealed itself in all its splendour. As with most venues in Romania, the admission is not expensive, and it gives you the opportunity to visit the chambers of once great kings. Alba Iulia was a short stop on the way to Hunedoara. 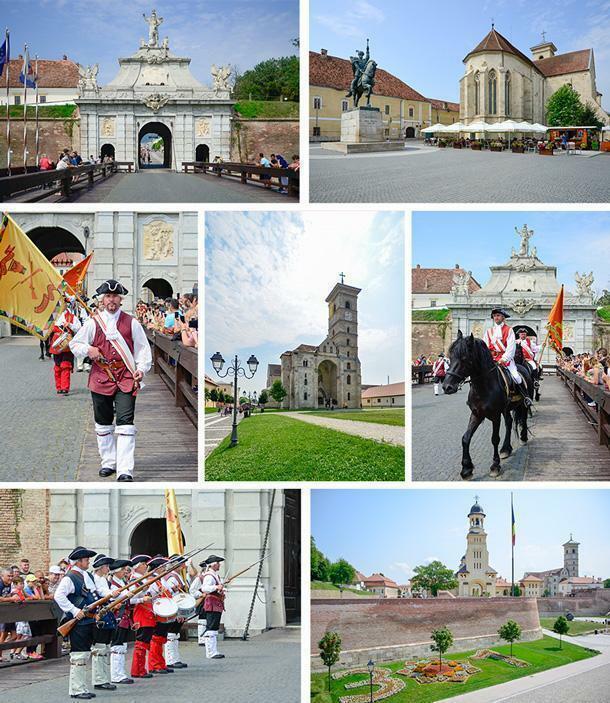 My family insisted I observe the changing of the guard at the Alba Carolina Fortress – Romania’s largest fortress. The city of Alba Iulia, in Alba County, is one of the most important urban centres in Romania. The city is historically significant, as it is associated with the Great Union of 1918 and the coronation of the kings Ferdinand I and Mary, the first monarchs of Greater Romania. Alba Iulia’s medieval centre, the Alba Carolina Fortress, encloses several centuries old attractions, including Saint Michael’s Cathedral. The changing of the guard takes place daily at 12 pm and in only lasts about fifteen minutes. Due to lack of time, this was the only thing we saw but do allocate a lot more time and visit the churches and the catacombs of this ancient site. On the grounds of the fortress you will also find restaurants and little street vendors eager to recharge your batteries with good food and snacks. 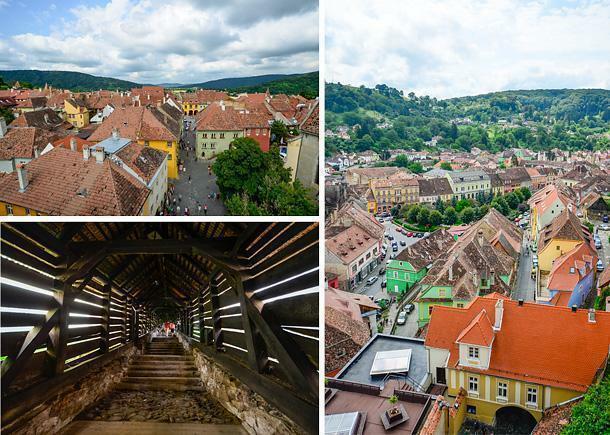 Sighisoara is a UNESCO World Heritage Site and a point of interest you cannot miss while visiting Transylvania. 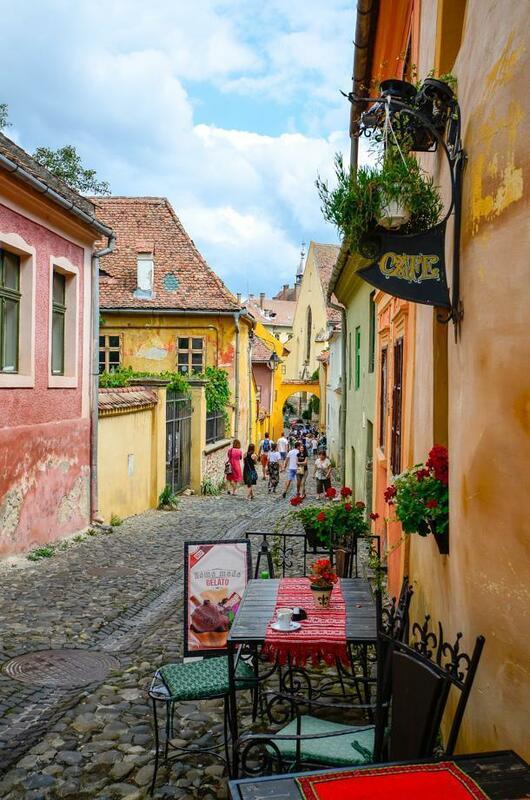 One of the main reasons Sighisoara is so popular is it is the birthplace of Vlad the Impaler, Prince of Wallachia, the inspiration for the fictional vampire Count Dracula. His birth home is today a restaurant on the bottom floor and a little medieval weapons museum on the second floor. 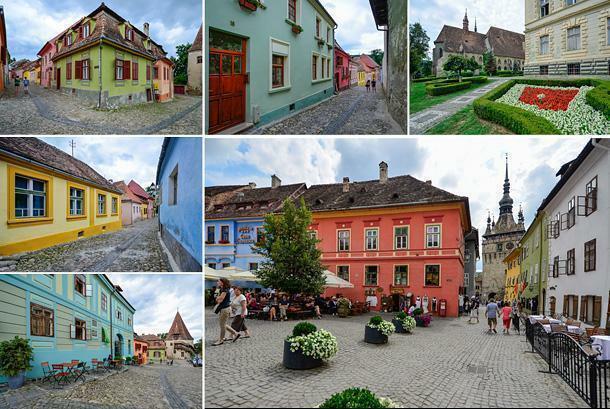 How can you not be charmed by Sighisoara, Romania? I wanted to visit because the historic centre is full of charm and colour. We spent a few pleasant hours here discovering the little cobblestone streets leading to the main square. The main attraction in the old centre is the Clock Tower. 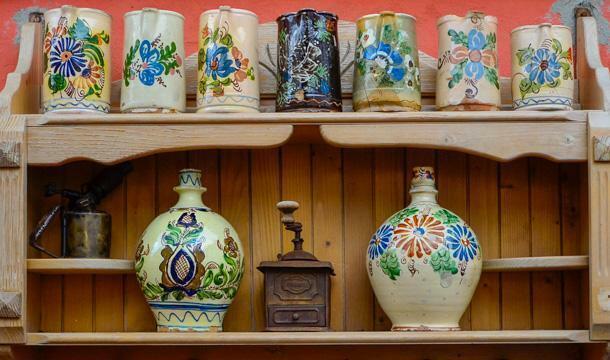 For a small fee, you can visit the tower and the little museum spread across several levels, displaying objects highlighting Sighisoara’s past. I highly recommend doing this as the views from the top of the tower are worth the effort of climbing the old wooden staircase. It’s worth the hike up the clock tower for these stunning views. Another notable site is the Covered Staircase. Brace yourself for this one as there are 176 stairs to climb. At the end of the staircase is another important site in the historic town, the Church on the Hill, a Gothic-style church that took 180 years to build. Apart from these main sites I was able to squeeze in a traditional countryside fair (called a targ). In August there are some big fairs in the area. The country fairs are a lot of fun, especially if attending with kids. See farm animals, eat good food and peruse the many tables covered in knick-knacks. The food is on the heavy side – lots of BBQ meats that smell so good, they would convince even the staunchest vegan to try a bite. For my kids, this was the highlight of our trip. I am sure buying them funnel cake, known here as kürtőskalács, had something to do with it. One last thing I was able to take part in was the making of tuica. Germans have schnapps; Italians have grappa; Romanians have tuica, made in the mountains of Transylvania. It is made from plums grown organically, not by choice but by necessity, in a rural community where the way life seems undisturbed since the middle ages. Known for its strength, tuica has been known to bring both joy and misery. This is an elixir whose intoxicating magic has come to mean more than hard currency (people often barter with tuica). Being able to serve guests a shot of good homemade tuica is a source of great pride, and those who have large amounts of it are well seen in the village as it means they have a lot of land and bounty. More than likely you will encounter it on your menu. Give it a try and enjoy the wonderful plum aroma. Party until the cows come home in Transylvania! Transylvania is a region of great historical importance to Romanians and subject for legends and novels. It holds a lot more undiscovered sites and, after having a little taste, I cannot help but to go back hungry for more.